Full Flow Oil Filter Assembly With Paper Type Cartridge, Replacing Partial Flow Oil Filter Assembly With Sock Type Cartridge. Production and Service BD-282, 308 Engines. Service Only BD-269 Engines. 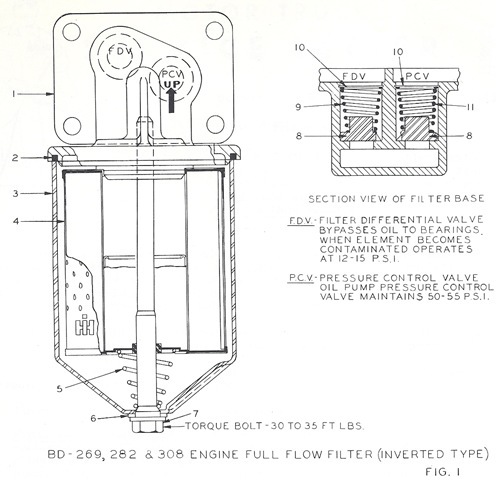 A full flow oil filter assembly utilizing a paper type filter element cartridge Fig. l is now being used on production BD-282 and 308 engines to replace the partial flow filter assembly with sock type filter cartridge. The full flow oil filter is designed to filter all of the oil entering the engine main oil gallery, providing more effective engine bearing protection. The full flow oil filter is installed in an inverted position (Filter Shell Down) while the partial flow filter was installed in an upright position. differential valve and pressure control valve. require changing the filter element more frequently until engine is clean. The frequency of oil filter element change depends entirely upon the type of operation, road conditions, mechanical condition of engine and quality or type of oil being used. Refer to full flow oil filter maintenance instructions. Pressure control valve controls the pump discharge pressure at 50-55 lbs. Oil relieved by the valve is directed back into the oil pan. NOTE: Use of the full flow oil filter required increasing the oil pump pressure from 35-45 lbs. (maximum pressure 1500 R.P.M.) to 50-55 lbs. to assure satisfactory engine main oil gallery pressure in the event the filter cartridge element becomes clogged. Where improved oil filtration and increased bearing service life is desired on BD-Z69, Z82. and 308 engines in service, a full flow oil filter assembly is now available through service parts. This full flow oil filter is available in a kit, under part number Z17 794 R91, which contains the necessary parts and installation instructions. 4-120383 Washer, Lock 7/16 Med. Serviceable component parts for 214561-R91 oil filter assembly. Refer to Fig. l for location and Key No. Key IH Part No. Description No. Req”d. Full Oil filter maintenance instructions. The frequency of oil filter cartridge change depends entirely upon the type of truck operation, road conditions, mechanical condition of engine, and quality or type of oil being used. Filter cartridge life cannot be determined by mileage or hours of operations alone. The mileage and hour figures shown are given merely as a guide, as operating conditions vary. Should changing the oil filter cartridge be neglected when the cartridge becomes filled with contaminants, the filter will cease to function, permitting contaminants to accumulate within the engine. This will shorten the life of future cartridges and new oil, until such time as the engine is again clean. 90 to 120 hours. Remove oil filter body and cartridge. Clean inside of filter body and install cartridge. Torque oil filter shell hold down bolt 30-35 ft. lbs. Operate engine a few minutes and check filter for leaks. CAUTION: More frequent cartridge changes are required, depending on rate of oil contamination caused by extreme dusty conditions, multi-stop and cold-weather operation. Lubricant capacity of the full flow oil filter 1S approximately one quart. It is our belief that every customer is entitled to and shall receive two distinct services . . . These “kits” are usually only available at IH Truck dealers, and even then, they are not always available.